In my early twenties I lived near a forestry commission woods where the trees were being harvested by a team using a horse. This wonderful Clydesdale was called "Barney" and I got to know him pretty well. He was master of the job, patient and strong, but with a very definite personality. One year, we gave him a special grooming and cleaned all his harness so that he could pull the village May Queen's float. He seemed to love the attention that day, yet the day after when I found him at work in the woods, he nodded his head in greeting, as if to say "business as usual, pal!" 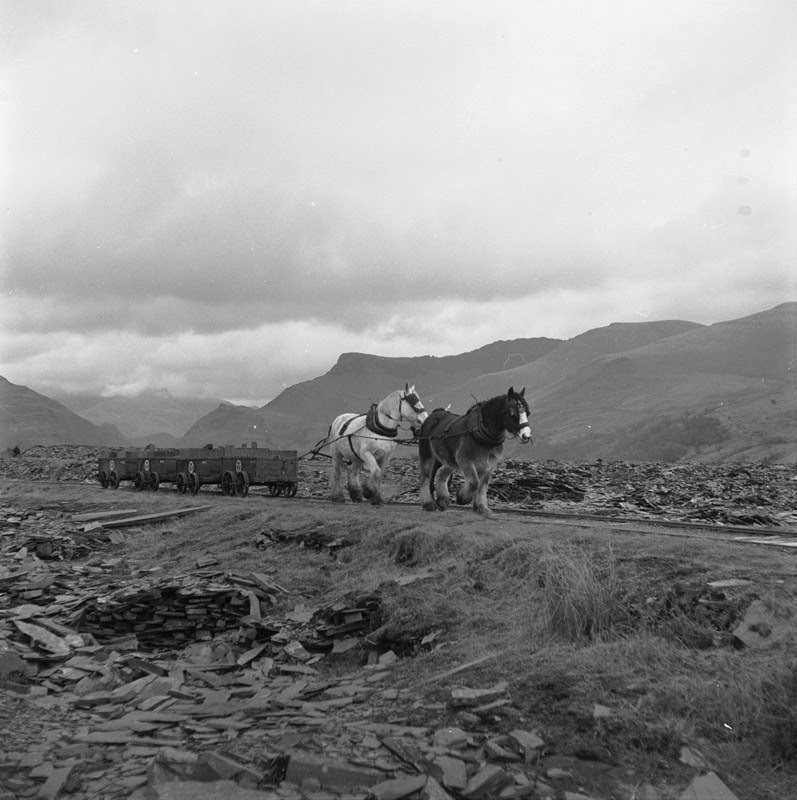 When I started to study the quarries of the Nantlle area, the recurring photographs of the tramway horses began to fascinate me. I remembered old Barney and wondered what the story of these horses was. Boyd's book (see the references at the end) was a good starting point. 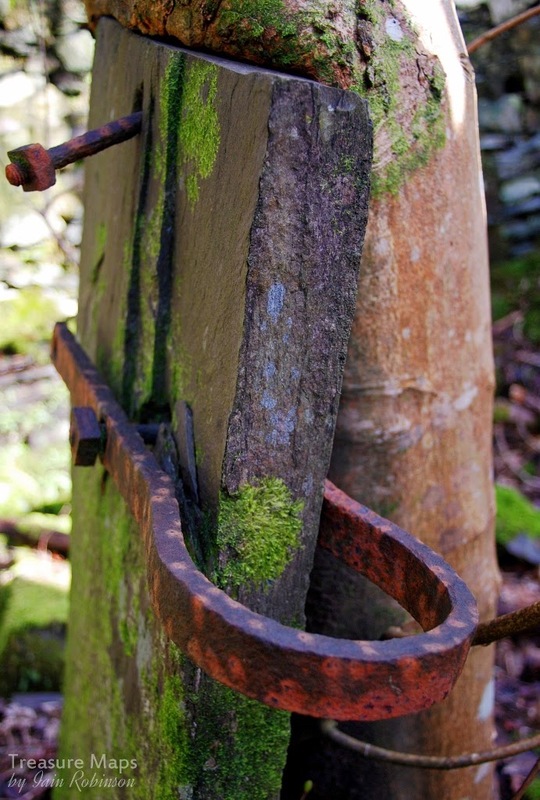 For the record, the railway was a horse-drawn waggonway that carried slate from Pen-yr-Orsedd and all points in-between to sidings at Talysarn. Originally it had run all the way to Caernarfon, but was taken over in 1865 by what later became the London and North Western Railway and was converted to standard gauge from Caernarfon as far as Talysarn. Ironically, while much of the route of the 3'6" gauge waggonway through the quarries survives, the old LNWR trackbed is now the road that you would use if you came to Talysarn from the Porthmadog-Caernarfon road at Penygroes. Information about the horses is scarce; few written records seem to have been kept. What I know so far has been kindly imparted to me by several locals, especially John Williams and the late Dr Gwynfor Pierce Jones. 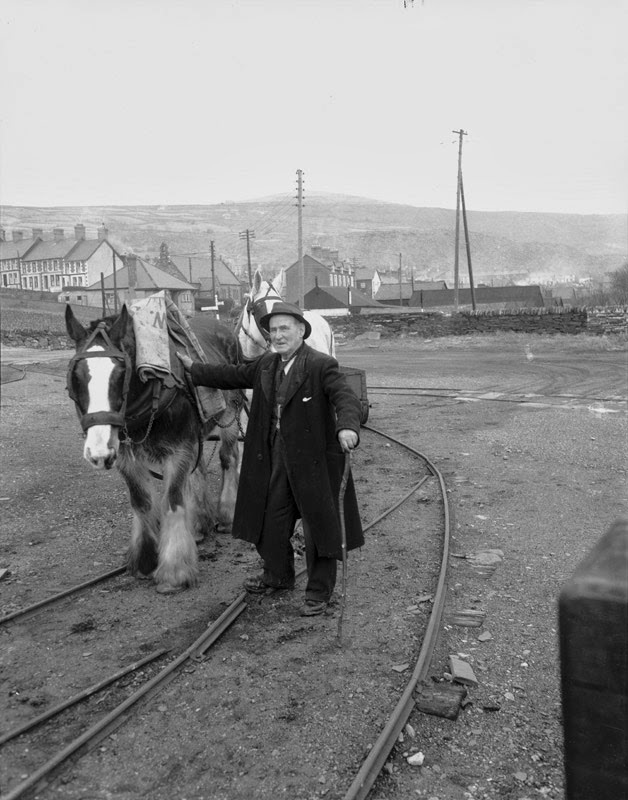 Luckily, one of the great photographers of the 1950's, Geoff Charles, took an interest in Dorothea and made many images of the horses and the folk who worked the Nantlle quarries in the 1950's. The header image is of "Corwen" and "Prince" and is shown courtesy of the wonderful National Library of Wales Collection. "I grew up in Talysarn, and was closely associated with the the white mare called 'Corwen' and her gelded son 'Prince'. I had a lot to do with them when Thomas Williams (Tommy Run) was in charge of the team.They belonged to 'Willie Jones Y Glo' (Willie Jones the Coal) and latterly his son Oswald. A part of my childhood revolved around these two magnificent animals"
That was something completely new to me: that Corwen was Prince's mother. 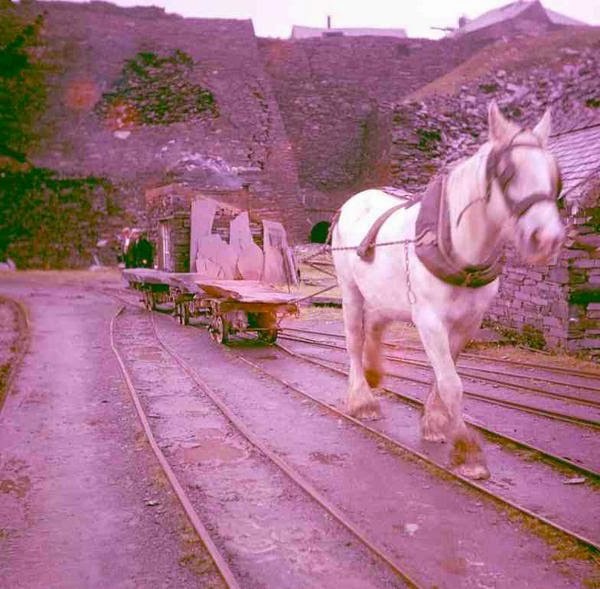 It seems that different horses were used for the 2' gauge quarry lines and for the tramway itself, which was laid to 3'6" gauge and utilised waggons with double-flanged wheels. Over the years, different contractors were used to supply the horses. 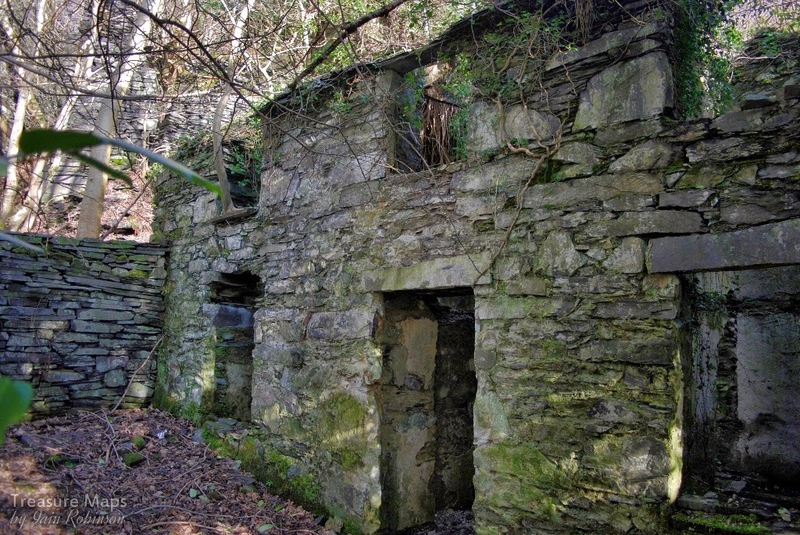 One such was a Mr Pritchard, who lived in a house in the lost village of Talysarn Uchaf, underneath the vast Gallt-y-Fedw buttresses across from what was once Foundry Terrace, where the divers now park their cars. Here there was a stable block and a waterwheel driving a chaff cutter, to prepare food for the horses. John Williams remembers the constant thumping sound of the oil engine that replaced the waterwheel in the 1940's. 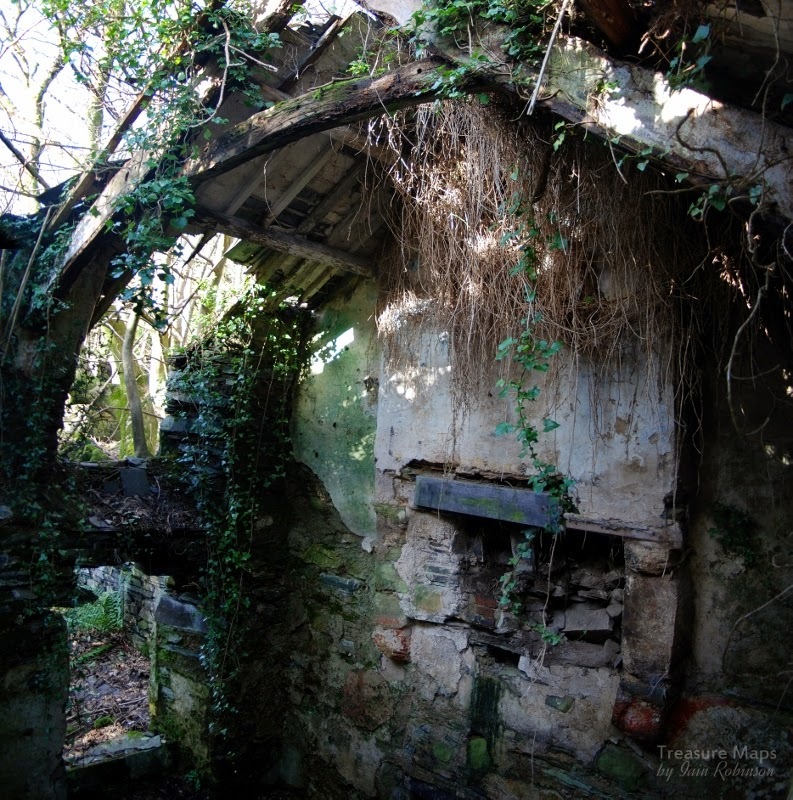 Here are a couple of my photos of the stables and Mr Pritchard's house- for more, see my set on Flickr here. Most of these contractors had several different occupations and it certainly seems that Mr Pritchard kept pigs and other livestock and had a cart for other transport jobs outwith the scope of the tramway.. I've not been able to source any old photographs of the stables, but took several of the ruins on my many visits to Dorothea. 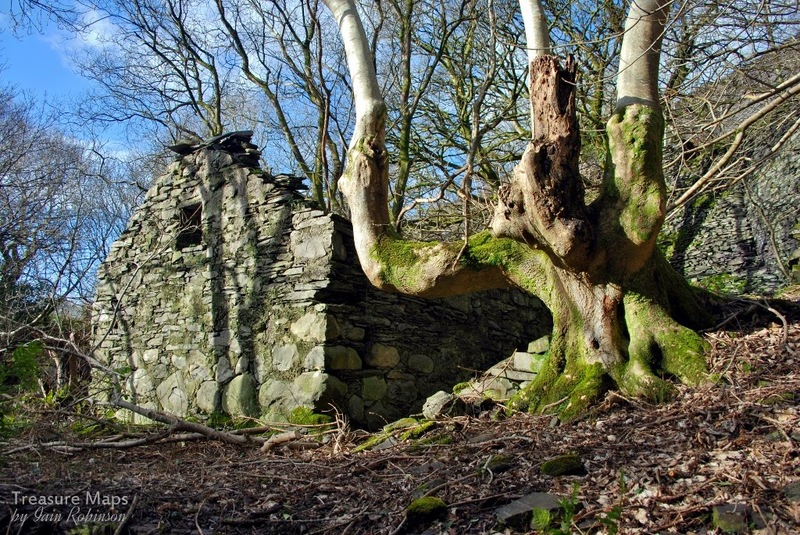 Trees have grown around the slabs that separate the horse-stalls, and nature is taking over in her slow but inexorable way. I don't think it will be too many years before the huge bastions that teeter over the houses here will fall and engulf everything. I always feel at Dorothea that I have been priviledged to see this...one way or another, it won't be around for too much longer.
" The pair were actually stabled behind the family house in Station Road....right at the top of the garden! There was an irony in having a Petrol pump for selling petrol at the front of the house...and a stable at the back! It was a testing moment the last 20 yds to the stable...as they knew food would be waiting for them in their stalls...and they would really race the last 20yds! In the spring and summer they would be grazed overnight during the weekends at different places.. one being the field that once existed between the drive to the Nantlle Vale Pub, and the Baptist Chapel.Often in the summer, they would be grazed at Ty Mawr farm Nantlle...the premises and fields immediately to the left after going over the river bridge towards Nantlle. Where Wili Jones and latterly Oswald kept the cars...and the hearse, right at the back of the shed there was a machine that chopped hay into short lengths 'chaffing' I believe it was called ? This was fed to them ..perhaps mixing in Oats and other supplements. I adored them both..and was gutted when they were sold." As Alwyn noted, the horses were worked by Thomas Williams ("Tommy Run"). 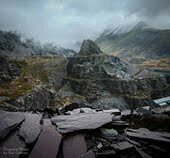 "My brother in-law Ian Roberts who was 15 in the sixties used to walk to Taldrws farm from Talysarn at 5 every morning to bring Sam the horse to Dorothea quarry to work and take him back at the end of shift." This confirms Gwynfor's notes about the quarry horses, and now we know one of them was called Sam. Thanks, Hugh. In the 'fifties, Prince and Corwen became minor celebrities. They even had an article written about them in the Liverpool Daily Post. They handled a few railtours, such as the one below, on the 5th May 1957, photograph by kind permission of the J W Sutherland Archive. This looks like the stretch of line just west of Bont Fawr, the enormous slate bridge that carried the quarry waste tramway over the road between the Talysarn pit and Cloddfa'r Coed slate quarry. 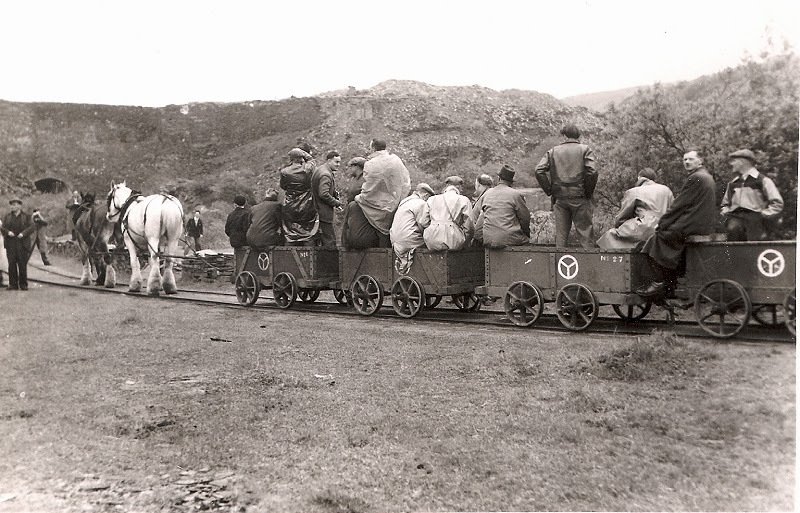 Note the Nantlle Railway symbol on the waggons. One amusing story is that on one of the railtours in the fifties, a couple of young ladies accompanied the gaberdined gricers. During the trip, sugar cubes were given to Prince and Corwen and on the way back the horses got a little "high". In a fit of equine exuberance, they pulled the entire train away from the track and set off for grass, thankfully with no injury to human or horse, although I can imagine the shouting from Mr Jones! Not that the horses were unused to treats, there are many photographs of them with local children on their backs or standing contentedly being petted by folk. Like most horses, they were also very intelligent. It is said that they could work a return empty train all the way back to Pen-yr-Orsedd unaccompanied, where they would stand and patiently wait for the waggons to be crewled up the incline. One of Prince's last assignments was to appear at the Ffestiniog Railway Vintage Gala in 1963. By then, Corwen had died and Prince followed soon after. The railway itself closed that year. "they stopped using the horse as the result of a Business Consultant's report (from London, who was horrified by the noise and dirt of quarry working!). He said it made the business look old fashioned and was a bad image. So they bought a grey Fergie instead." 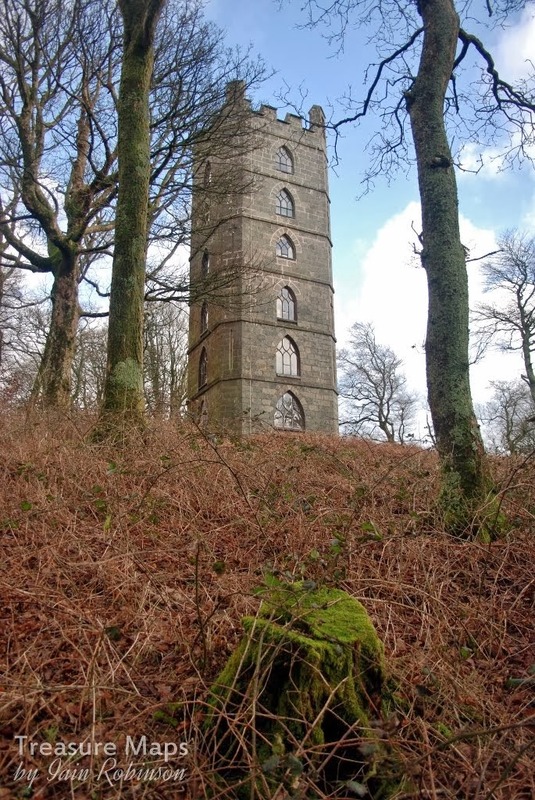 I spotted this interesting image of Corwen at the Eastern pyramid of Dorothea. Hauling slab to the Dorothea mill, ears back, listening for instructions from the handler. 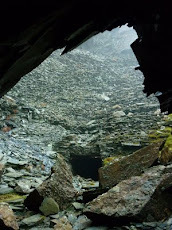 The slab was probably from the Pen-y-Bryn working, which was re-opened in the late fifties for a while. It's by Max Sinclair and can be seen on the excellent "Narrow Gauge Heaven" web site. This photo confused me at first, until I realised that the transparency was back-to-front. Suddenly everything made sense! Corwen at the Eastern Pyramid, Dorothea. By all accounts, the horses were much loved. During one of our conversations about the quarry and the horses with John Pen-y-Bryn, he showed us their grave...it's a lovely, peaceful spot. I wish I could know more of their story. Needless to say, if anyone reading this has any more information, I would be most grateful and would love to add to the article. After Prince and Corwen had gone, it wasn't quite the end. There were a couple of other railtours along the tramway before total closure, hauled by a red and yellow international tractor. For me, it just wouldn't have been the same. A fine shot looking towards the quarries from Talysarn yard. This scene is still just about recognisable today. Geoff Charles Collection, by kind courtesy of the National Library of Wales. Very grateful thanks go to Alwyn Humphreys, Chris Powell Jones and Hugh for the fascinating information and encouragement. Geoff Charles Collection at the National Library of Wales including a very good biography. The Narrow Gauge Railways of North Caernarvonshire, Volume 1 by J I C Boyd, Oakwood Press. One of the horse-stalls in the stable. Great to see a record of the draft animals working the tramways. Oh, if I had a time machine! A lot of mysteries would be solved. Glad you enjoyed the post, Graham. I grew up in Talysarn, and was closely associated with the the white mare called 'Corwen' and her gelded son 'Prince'. I had a lot to do with them when Thomas Williams (Tommy Run) was in charge of the team.They belonged to 'Willie Jones Y Glo' (Willie Jones the Coal) and latterly his son Oswald. A part of my childhood revolved around these two magnificent animals. Your info about where Corwen and Prince were stabled is incorrect! Alwyn, thank you so much for your comments, which are fascinating and shed more light on these wonderful horses. I wish I had known them. I wondered if my information was correct...obviously not! Can you tell me where they were stabled? Thanks for a great post Iain. So often I'm told that things like this (or making wooden things by hand) aren't 'economical' and therefore they are swept aside by our 'modern' society. I can't help thinking that we are poorer for it in the end: are children better off for having experience of large machines instead of horses around them? I was lucky enough to grow up surrounded by horses, cows and sheep, so I understand entirely where you are coming from. To get to know and work with animals is to learn to be observant, patient and understanding. There is considerable skill in operating machinery, but no humanity, unless you count trying to be a kind and courteous road user. Children are always better off for the company of animals, some pit-bull terriers excepted. Business Consultant/Marketing Consultant et al..synonymous with waste of space! I have a good friend who had accidentally become a 'business consultant': he is trained as a software engineer but companies increasingly ask him to do more consultanty type things. One story he told was that a large company wanted him to get them a 'telephone conference' system. He agreed, went on Ebay, bought one, and installed it, then charged tham a lot of money for it. As he sait "The company could have done it for thirty Euro and a bit of time, but no-one seems to think of this... so they pay me a lot more to do the same job..." He tells me this is a fairly typical request. I can believe that, Andy...what a story. Sorry been so long coming back Iain. The pair were actually stabled behind the family house in Station Road....right at the top of the garden! There was an irony in having a Petrol pump for selling petrol at the front of the house...and a stable at the back! It was a testing moment the last 20 yds to the stable...as they knew food would be waiting for them in their stalls...and they would really race the last 20yds! In the spring and summer they would be grazed overnight during the weekends at different places.. one being the field that once existed between the drive to the Nantlle Vale Pub, and the Baptist Chapel.Often in the summer, they would be grazed at Ty Mawr farm Nantlle...the premises and fields immediately to the left after going over the river bridge towards Nantlle. Where Wili Jones and latterly Oswald kept the cars...and the hearse, right at the back of the shed there was a machine that chopped hay into short lengths 'chaffing' I believe it was called ? This was fed to them ..perhaps mixing in Oats and other supplements. I adored them both..and was gutted when they were sold. Thank you so much, Alwyn. That is most interesting information and I will amend the blog to take it on board in the coming week. Diolch yn fawr. My brother in-law Ian Roberts who was 15 in the sixties used to walk to Taldrws farm from Talysarn at 5 every morning to bring Sam the horse to Dorothea quarry to work and take him back at the end of shift.No photos only grainy stills from an old silent movie camera film only lasting seconds. Thank you very much, Hugh. That is most interesting ...so I now know that the quarry horses were stabled at Taldrwst in the sixties, as Gwynfor said, and that one of them was called Sam. It's fantastic to get information like this and I will amend the blog accordingly. Diolch yn fawr!